What is the pricing after the trial period? How do I pay for Pixelpop? Does Pixelpop work with any theme? My popup isn't showing up. Help! How do I find out who has signed up for my newsletter? I want to offer a 10% discount for my customers who sign up for my newsletter. How can I do that? Why do I have a red error message at the top of the app saying something about my HTTPS? How do I sync my popups with MailChimp? My customer's emails aren't being added to my MailChimp list. What gives? I have two Shopify stores and I want to use Pixelpop on both of them. Can I pay for both stores at the same time? How are popup views counted? I've been paying for Pixelpop for the past 6 months, but all of a sudden I'm on the Basic plan and my popups are locked - what happened? From your Pixelpop dashboard, click Account in the header menu. There are four plans to choose from: Basic, Starter, Growth, and Pro. Our Basic plan is limited to 500 total popup views per month, so if your analytics tell you your store gets more visitors than that, you might want to consider upgrading. If you exceed your limit of 500 views, your popups will no longer appear within that month. Also note that popups created on the Basic plan will include Pixelpop branding. The starter plan is $12.00 per month and offers 10,000 popup views every month. Besides popup views, the main difference between the Basic and the Starter plan is that popups created on the latter will not include Pixelpop branding. The growth plan is $24.00 per month and offers 50,000 popup views every month. It does not include Pixelpop branding. The pro plan is $48.00 per month and offers unlimited popup views every month. It does not include Pixelpop branding. Choose the plan that fits your goals and site traffic and click the appropriate Choose Plan button. BigCommerce users will be prompted to enter their credit card details for paid plans; Shopify users will be charged on their monthly Shopify bill. All Shopify app payments are run through Shopify, meaning Pixelpop will simply appear as a line item on your monthly Shopify bill in whatever currency you have set up. You'll pay for Pixelpop however you pay for Shopify. For BigCommerce, you'll be prompted to enter your credit card details on the Account page when you choose your plan. We accept Visa, Mastercard and American Express. All payments will be processed in US Dollars plus applicable taxes. You can uninstall Pixelpop from your Shopify or BigCommerce Apps page by clicking the Uninstall link (BigCommerce) or trash canicon (Shopify). You bet it does! Some popup themes pair best with our very own Pixel Union themes, but all of them can be customized to suit whichever theme you use. One common cause for this error is switching your primary store domain to a custom domain: for example, from store.myshopify.com or store.mybigcommerce.com to store.com. Our servers don’t yet know that you’ve changed you domain. But it’s an easy fix! Simply log back in to Pixelpop with your original store URL and we’ll update your domain listing. If you dismiss the popup, it will temporarily disappear. To view the popup again, open up your site in an incognito window. In Chrome, go to File and select New Icognito Window. In Safari, go to File and select New Private Window. In Firefox, go to File and select New Private Window. In Microsoft Edge, select the More (…) icon, and then New In Private window. In your Pixelpop dashboard, scroll down to find your newsletter popup. Beside the green edit button, click Emails then Download emails to download a CSV file of the emails you've captured and upload it to your mailing list tool of choice. You can also connect Pixelpop with MailChimp and Conversio to automatically add new signups to any mailing list. Here's how to do that. I want to offer a 10% discount to my customers who sign up for my newsletter. How can I do that? The best way to do this is to use the 'Email signup' popup type. 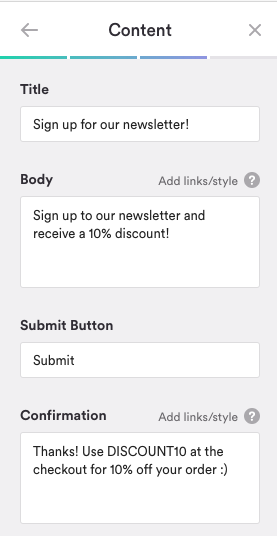 When you choose this option, you'll be able to add your discount code in either the body text, the 'confirmation' text area (this will show when the user enters their email and clicks 'submit'), or you can add the discount in the email that will come from the mailing list directly (externally). Note: the discount code would need to be already created, in the admin of your Shopify or Bigcommerce store. This is likely related to your domain settings in Bigcommerce. The app requires a secure SSL to function properly, so what you will need to do is reach out to Bigcommerce's support team to have them walk you through the process of updating your domain to support SSL. If you don't wish to update your domain, the other route to use the app is to update your browser's settings to allow for insecure SSLs. Each browser has a different set of instructions, so we would suggest a quick Google search for the instructions of your preferred browser. If you've done all this and are still seeing the error, please contact us at support@pixelunion.net! Great question! You'll want to start by connecting your Mailchimp account to Pixelpop in the 'Account' section of your dashboard. Click the 'Connect' button, and then follow the instructions to log into your Mailchimp account. Once you have it all setup, you can go to create an 'Email Signup', where you will be able to sync to your desired list on the third page of the editor. More information can be found from this article here. You might have double opt-in enabled! If you do, then your users are adding their email addresses to the popups, but they aren't clicking the 'confirm' button that gets sent to them in their emails. If this concerns you, you might want to consider disabling double opt-in! Note: if users enter their email addresses into the popup but then do not click to confirm the email in their email inbox, they will not be added to the Mailchimp list. I have two Shopify stores and want to use Pixelpop on both of them. Can I pay for both stores at the same time? Unfortunately, no. Each store must have Pixelpop installed and the billing will be assigned to the store. This is a platform limitation, so there isn't a workaround right now! Views are counted based on sessions. A session is basically any visit of the store within the browser - the popup will appear upon first load of the website. If the popup is dismissed (by entering an email address or clicking the X for example) at any point, it will remain dismissed for the rest of the session. If the browser is closed, the next time the website is opened will count as a brand new session, and the popup will show. If your card is declined by the bank at any point, the app will automatically put you back onto the Basic (free) plan. This plan has a limit of 500 popups so if you have already exceeded that amount, the popups won't appear. You'll need to change your card (or double check with your bank that your current card will work) and re-select the plan you wish to use. You can send a support request through our contact form. We'll get back to you within two business days.